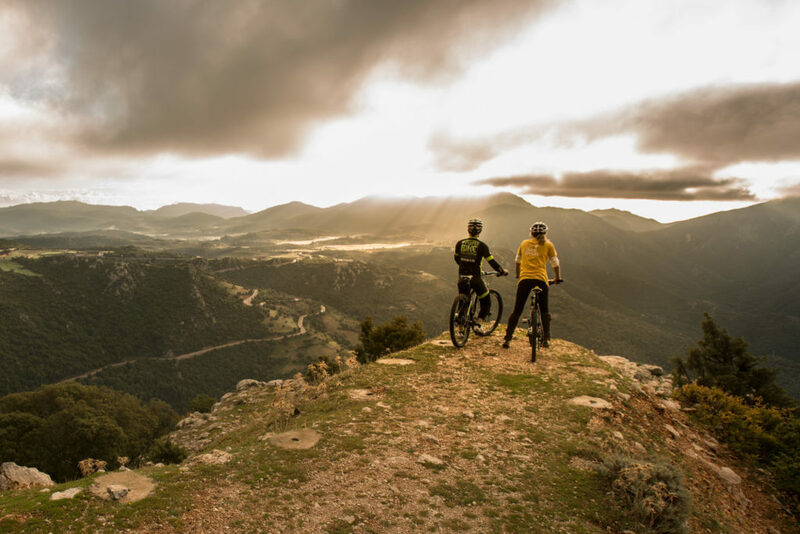 Thanks to the publication in 2011 of the first mountain bike guide of Sardinia for 20 years, written by Peter Herold, the ex owner of The Lemon House, and two Sard bikers, mountain biking on Sardinia is booming. In 2014 15% of guests in The Lemon House came specifically for a biking holiday, often bringing their own bikes, but most of the bikers are happy to rent the MTBs to the near rental (50 mt from our home) Clait. Clait offers good bikes for a chap price. If you want something of a slightly higher quality, you can enquire directly to us. 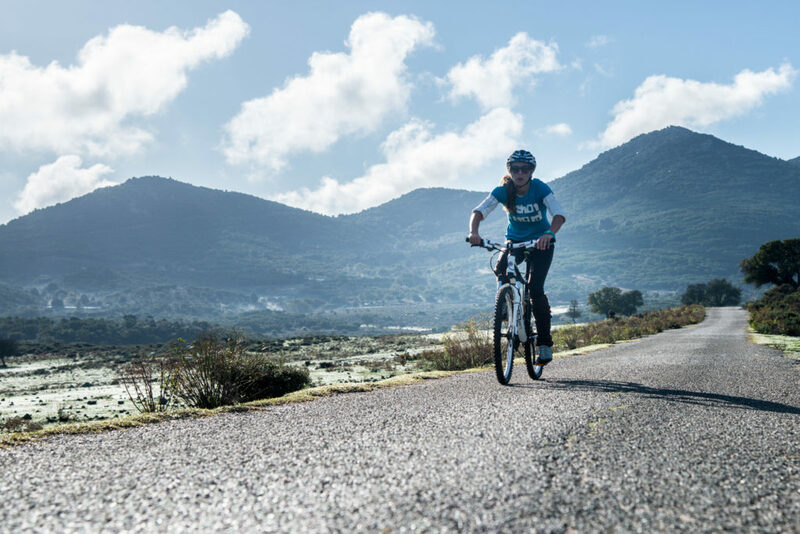 Whether you are after cross-country trails, technical singletrack or family mountain bike rides, Sardinia and especially the east coast on Ogliastra is the place for you! And you can combine your biking with a Mediterranean seaside Holiday 🙂 . See the banner at the top of the page! We advise our guests which are the best routes for them according to preferred riding style and ability, using route descriptions, GPS files, photos and videos. Mountain biking around where we live ont the east coast of Sardinia is likely to be very different from what most northern Europeans (the majority of our guests) find on their doorstep. We have easy cross country rides on fireroads in the valleys and in the rolling forests on the granite hills, more technical cross-country rides on rough singletrack – see eg Janet’s video above – and lots of really technical “alpine” singletrack. All the trails are natural and are next to the Mediterranean’s finest coastline, so that you can ride in the morning and swim in the afternoon. This is a KEY difference to mountain biking destinations in the Alps such as Riva di Garda or the Dolomites, and the riding is every bit as good, say our guests! One UK visitor commented that the singletrack descent to Cala Sisine (see the video above right of the singletrack from Su Irove Longu to the sea) was the “best descent I’ve ever done, even better for being natural”. A Slovenian said the 1000 m vertical descent singletrack from Olinie (see video above left) was a “singletrack worthy of the Alps”. The riding is different to a UK trail centre. On the All Mountain and Freeride rides, you have tight ‘alpine’ switchbacks and sharp and loose rocks you don’t find on a black run, like “Santa Maria Freeride”. There is almost no mud! And you can often ride all week without washing your MTB. From May to October it hardly rains, and even when it rains heavily the water soon drains away, though the flash floods do destroy the mountain dirt tracks where they cross the river beds, and many smooth tracks will have rocks exposed after rain. There are no trail centres, nor professionally-maintained singletracks… you have instead are easy rides in the valley and in the rolling forests on the granite hills along relatively easy Forestry tracks suitable for 4WD vehicles, or the shepherds’ 4WD tracks on the Supramonte. Singletracks: choose from the “Isola di Sentieri” paths, and rocky, technical singletrack climbs and descents along old muletracks made by shepherds and charcoal burners and suitable for good MTBers on the limestone Supramonte. There is a lot of climbing! Within 8 km of The Lemon House the ground climbs up to 700m, and so you soon find yourself on steep climbs or (more fun unless you have a road bike background) descents. We give people a lift up to the plateau above Baunei, or Arzana, Talana and Urzulei, in our 4wd (or take the bus) so that they can do rides which involve less climbing, and then roll back down.